Famously, Suffolk has no motorways. There are A-roads, B-roads, and a-long-way-from-any-other-roads. It is by way of this last category that we reach Wingfield, lost as it is in the lattice of dog-legging, high-hedged lanes somewhere between Eye and Halesworth. Even if there was no church, Wingfield would still be famous. It has a castle which isn't really a castle, and a college which is no longer a college. It was the combined power of these two, coupled with one of the most powerful families in late medieval England, which has given St Andrew the shape we find it in today. 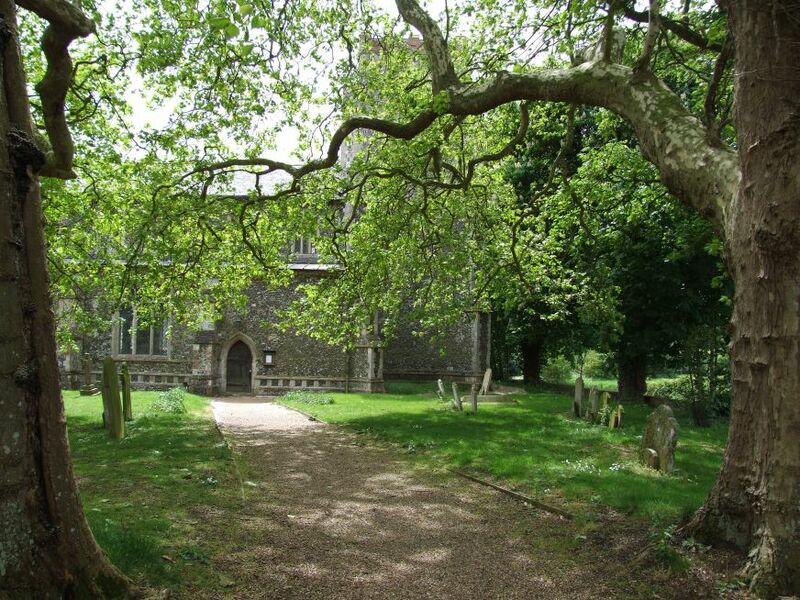 And even if it was just the church, this would still be a beautiful place to come, an elegant building of the 14th and 15th centuries set in a small, sloping, rambling graveyard at a curve in the climbing road beside the village pub. 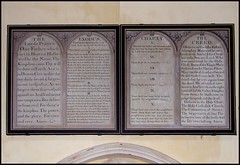 Fine 18th and early 19th century gravestones abound, and not a great deal seems to have happened since, as if the sleepy air of this backwater has had a soporific effect on the powers of the seasons, the village, and even the passage of time itself. 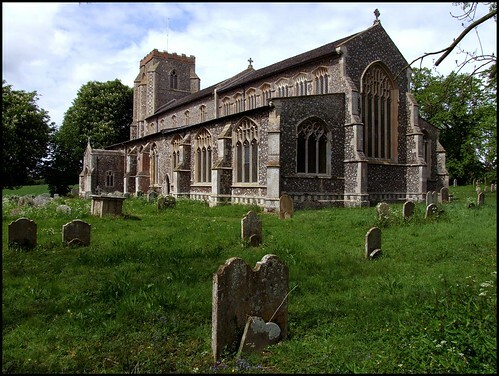 But if the graveyard is a place to remember our ancestors now just out of reach, St Andrew is a document of the events, enthusiasms and urgencies of the late medieval period. The great defining moment in English history was the wave of virulent disease which swept western Europe in the middle years of the 14th century, for which the Victorians would coin the popular phrase 'the Black Death'. This outbreak of bubonic and pneumonic plagues would, in the short term, carry off half the population of East Anglia, but it was the economic consequences which would have the greater effect in the long term. As the sons of the old landed families were carried off by the pestilence, so the old estates were broken up and sold off to a rising merchant class. The fall in population resulted in a shortage of labour, handing economic leverage to the ordinary people for the first time. A surplus of consumable produce, and money to spend on it, meant that by the second half of the 14th century we can for the first time identify what might be termed a middle class emerging in English society. The old feudalism was giving way to what was a kind of proto-capitalism. Many familes who rose to prominence during this century became fabulously rich. They exhibited their wealth in their houses and their households, and exercised their piety in donations and bequests to the Church, either in the form of buildings and furnishings, or by paying for Priests. Much of this effort was aimed at ensuring the prayers which would be said for them after they were dead. They hoped to escape the long centuries in purgatory which many of them clearly deserved. Part of this project involved an attempt to reinforce Catholic doctrine in the face of local superstitions and abuses, to make sure that the ordinary people knew their duty. Ironically, many of these families would, a couple of centuries later, embrace firmly the new idea appearing on the continent, Protestantism, and oversee a destructive Reformation in the parish churches that their ancestors had built up and beautified. But that was in the future. 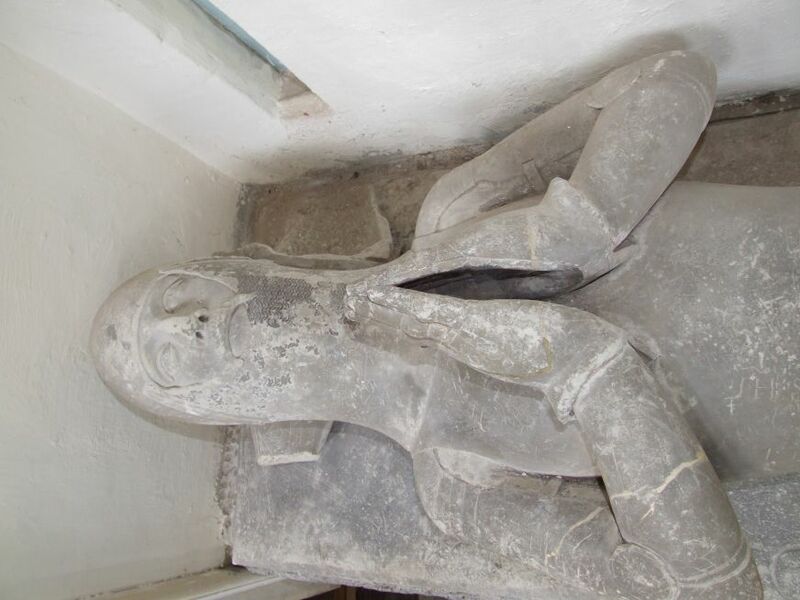 Sir John Wingfield, whose family had owned the manor of Wingfield for generations, survived the Black Death, and perhaps as a form of thanksgiving he established a college of Priests here in Wingfield in his will of 1361. The college buildings survive at the heart of later buildings just to the south of the church. 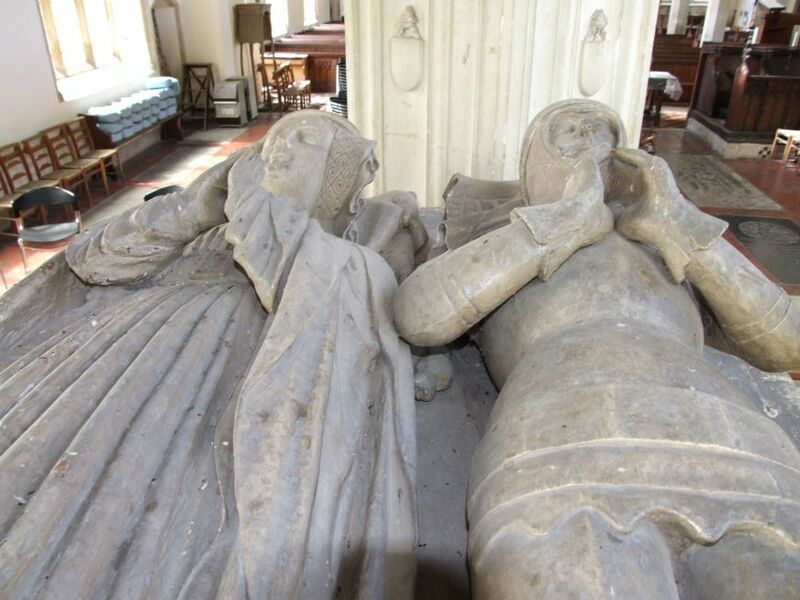 Wingfield's personal fortunes had been bolstered by marrying his daughter into one of the parvenu families which rose to prominence in the 14th century. 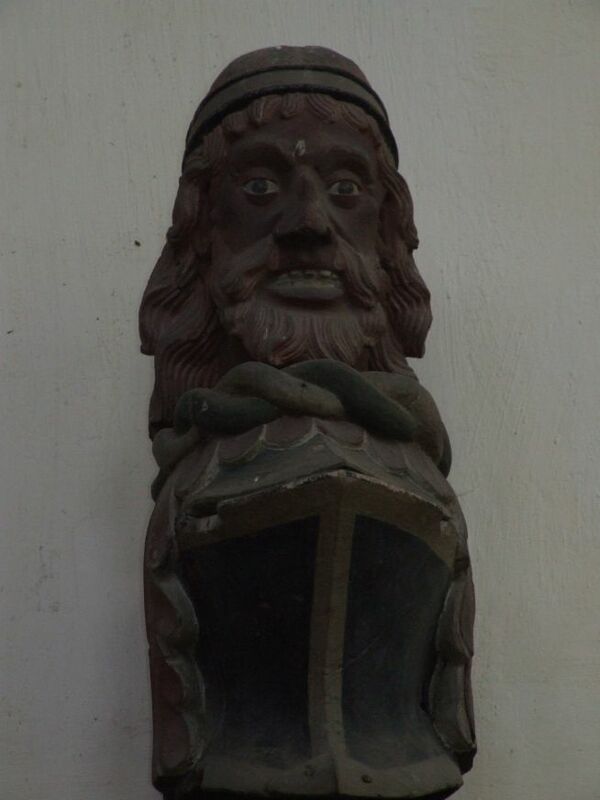 These people were merchants and traders in the northern coastal city of Kingston upon Hull, nearly two hundred miles away, but theirs was a name which would come to be intimately linked with the county of Suffolk. They were the de la Poles. Wingfield's grandson, Michael de la Pole, would inherit the Wingfield estates. He built the fortified manor house known as Wingfield Castle, and in the later decades of the century and the early years of the next, he oversaw a massive rebuilding of the church. 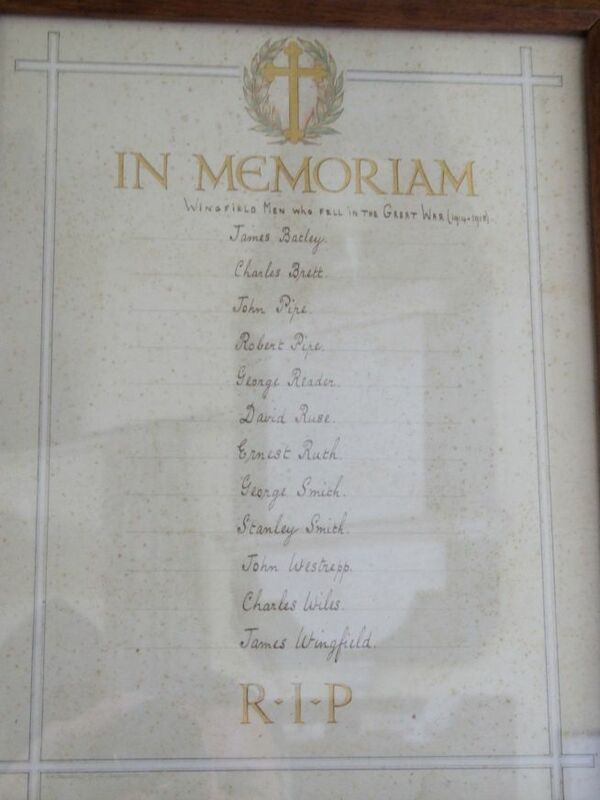 Only the low tower was left from Sir John's day. De la Pole's father William had been made first Earl of Suffolk. He increased the family's wealth by lending it to the Crown. But it is Michael de la Pole's son that history remembers most firmly. John de la Pole, second Duke of Suffolk, was a notable figure in Shakespeare's Henry VI parts I and II. Wounded at Harfleur, he watched his brother die at Agincourt: All my mother came into mine eyes and gave me up to tears. The most powerful man in England, equivalent of Prime Minister and leader of the military, he surrendered at Orleans to Joan of Arc in person, and his family paid £20,000 for his release, roughly ten million in today's money, but a drop in the ocean to them. John ended up in his grave rather earlier than he might have expected. Exiled for five years under tenuous circumstances, he was murdered by Henry VI's henchmen as the ship taking him into exile left Dover. On the day before he died, he wrote a letter to his young son enjoining him to look after his mother: Always obey her commandments, believe her counsels and advices in all your works. This message was received by the boy's grandmother, who by virtue of her father's marriage was granddaughter of the writer Geoffrey Chaucer. Sir John Wingfield, Michael de la Pole and the second Duke of Suffolk, John de la Pole, are all buried here in the chancel at St Andrew. To reach them, you step into the porchless north door of the nave; the porch on the south side was intended to serve the college. The nave is wide and square, and full of light even on a dull day thanks to the lack of modern glass. Only the floor tiles strike a jarring note; what was considered the height of taste in the late 19th century is now, rather unfortunately, reminiscent of Burberry - a bit like chav lino, innit. But never mind, for fashions will change again, and in any case the eye is drawn by the creamy light of the stone-faced chancel, the great arcades seeming to swell and soar as they head eastwards to the drama of the great Perpendicular window. The chancel aisles continue, the arches become resplendent in motifs and riotous capitals. 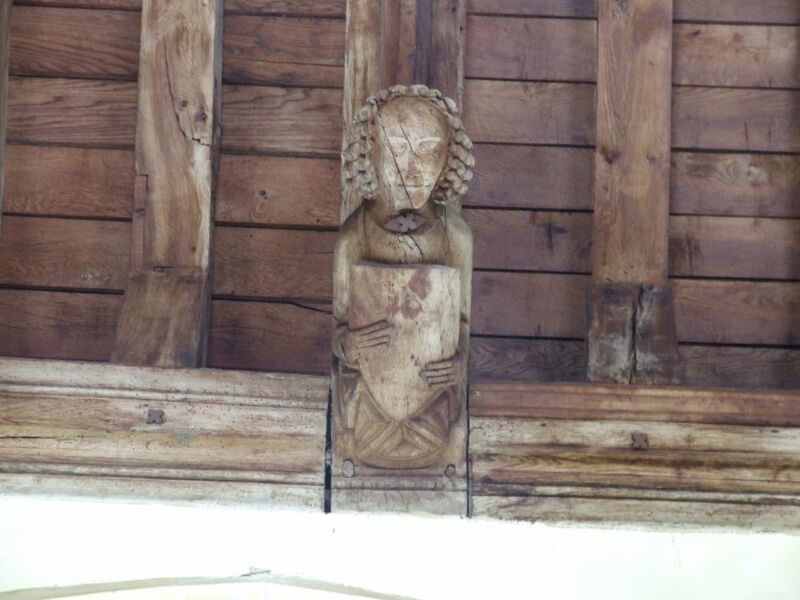 And above, the clerestory does something extraordinary. 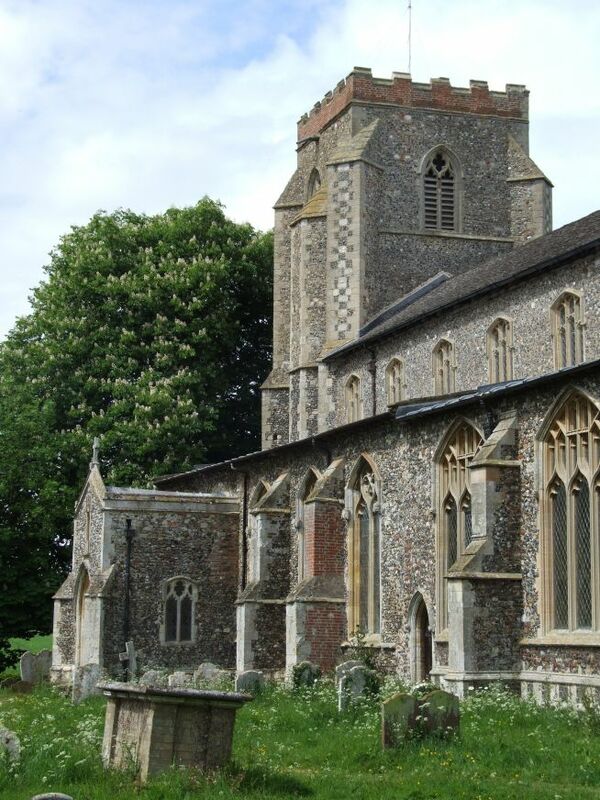 What had been a simple range of five evenly spaced windows on each side above the arches, becomes a Perpendicular wall of glass, seven windows on each side of the chancel huddling together and picked out in brick which may well have come from the de la Pole's works in Hull. Conversely, the great range of aisle windows in the nave continues into the chancel on the south side, but on the north becomes sparser and erratic, leaving wall space for monuments. 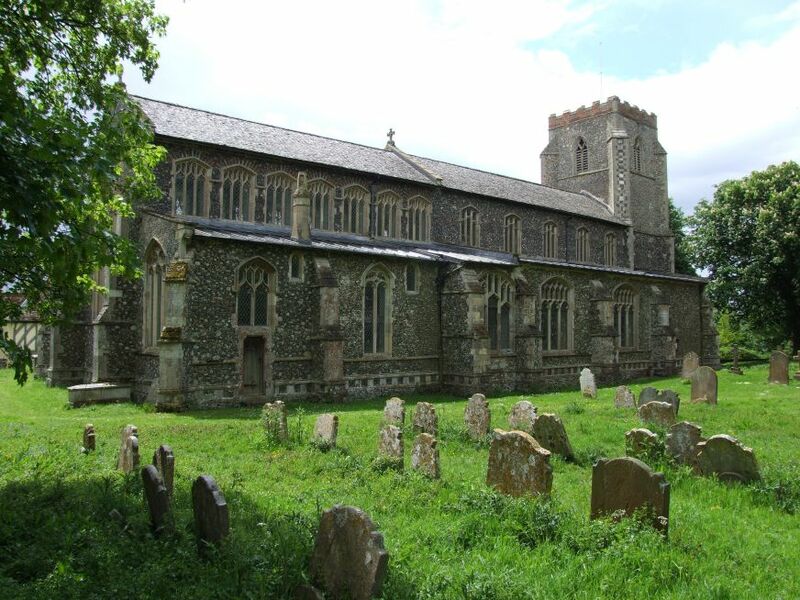 For here was the final resting place of one of medieval England's most powerful families. 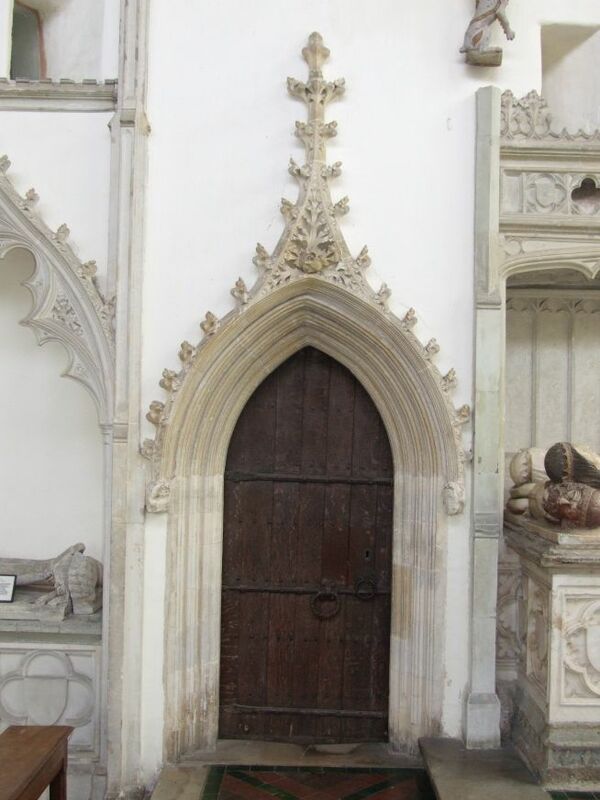 A marvellous crocketed and canopied archway surmounts what is now the vestry door, but was once the way into the chapel of the Holy Trinity. 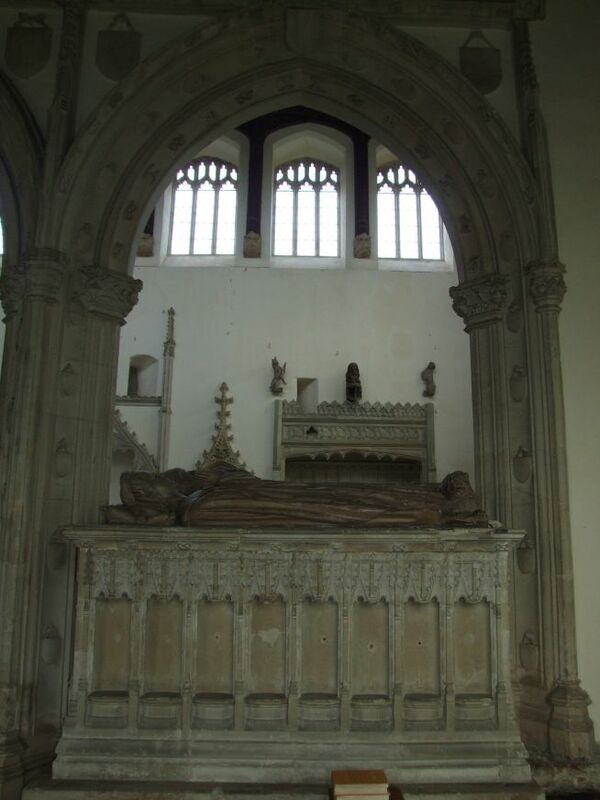 Beside it, within a magnificent canopied easter sepulchre, lies the effigy of Sir John Wingfield, founder of the feast. 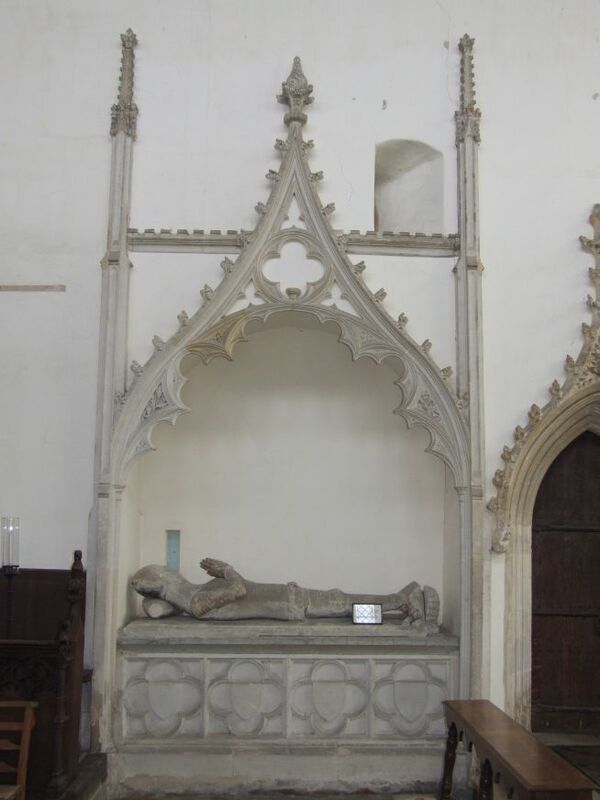 Michael, Earl of Suffolk, lies across the chancel between the sanctuary and the south aisle chapel, his great tomb set within the arch of the arcade. 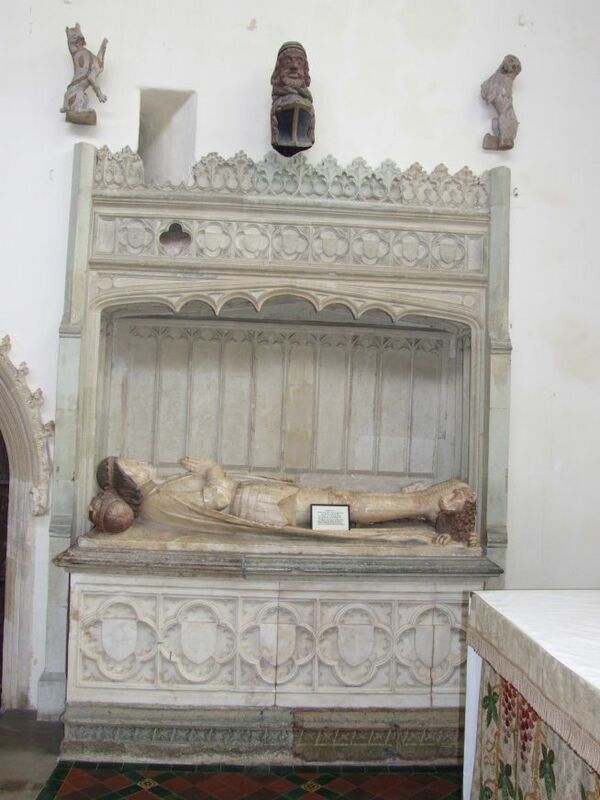 Beside him is his wife Katherine, and their effigies are made of wood, a fairly late example of the technique. An earnest little lion sits up, alert, beneath his feet, and under his head is a sleeping, bearded saracen, his mouth grinning in the rictus of death. One of the most spectacular features of the tomb is the way that the sedilia are built into the northern side, which at once shows that the tomb is in its original location, and also unites the de la Poles in the sacramental liturgy of the church. 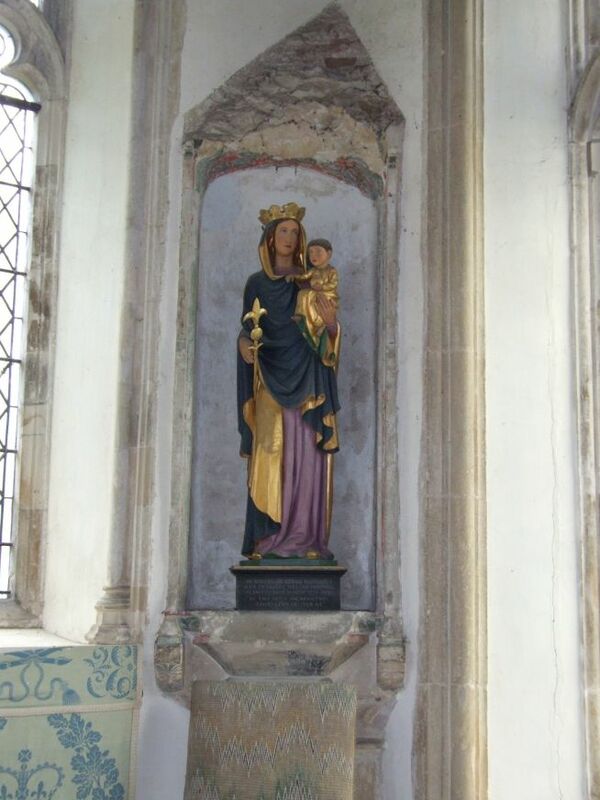 But the finest monument here is back across the chancel, on the other side of the sanctuary and backing the wall to the chapel. This is John de la Pole, second Duke. 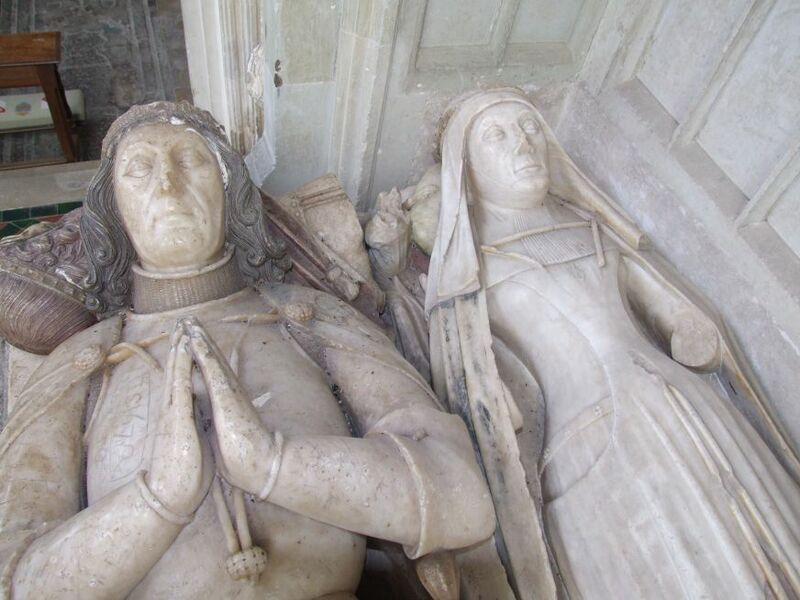 He lies in alabaster beside his wife Elizabeth Plantagenet, sister of Edward IV and Richard III. Their tomb echoes that of John's grandfather, but there are subtle differences. His iconography is the same, but the rendering of the images has changed in half a century. Now, the lion is softer, prouder, and the moor is startling and dignified. 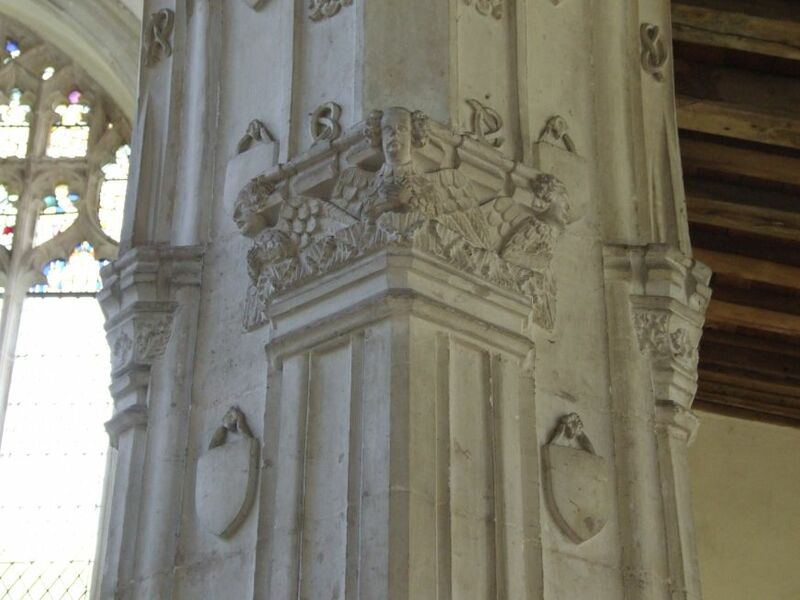 This dignity extends to the whole structure, surely one of the finest memorials in England from the later part of the 15th century. Looking at Duke John's face, it seems inarguable that he was sculpted from the life. Beside him, his wife, her pillow borne to heaven by flights of angels, the tiny disembodied hand of one surviving poignantly beside her as she sleeps. 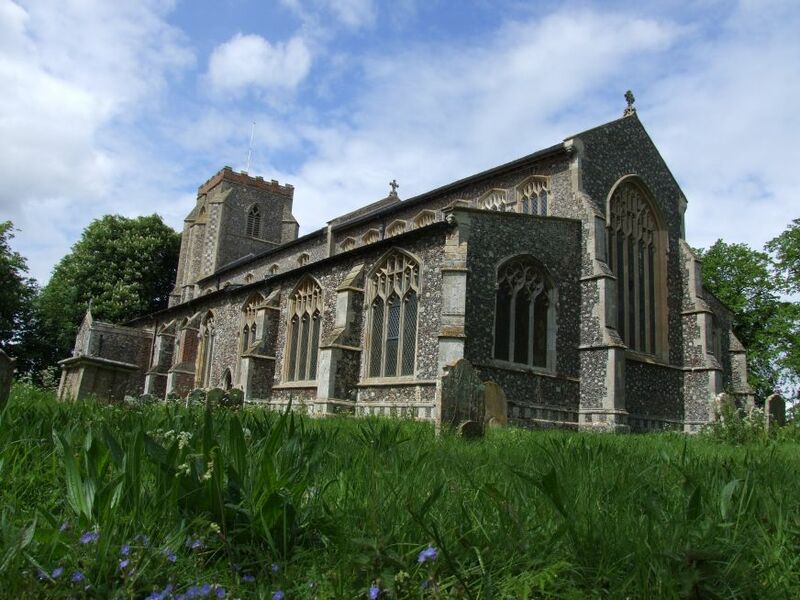 St Andrew is a tale of two churches, a church of two halves. 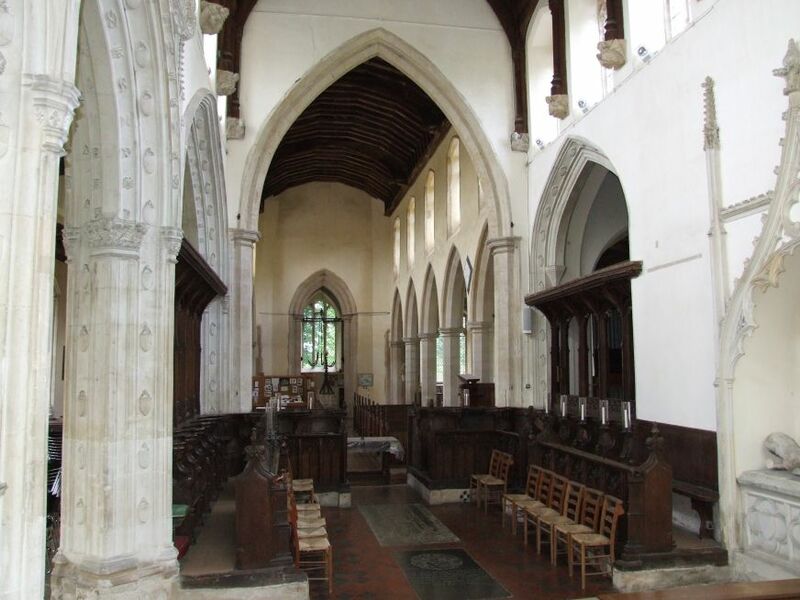 Perhaps no other chancel in Suffolk is as magnificent as that of Wingfield, and it does rather put the nave in the shade. 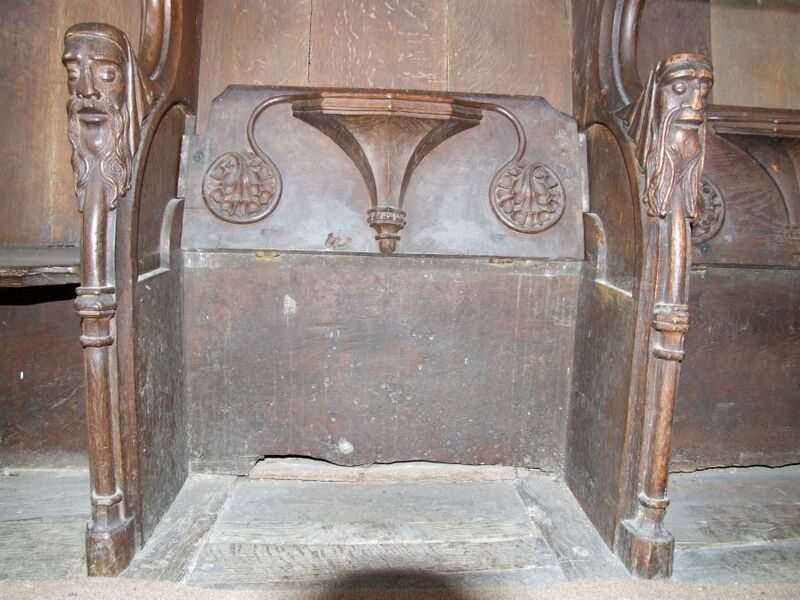 The return stalls survive from the days of the College of Priests, with misericord seats and sombre heads on the hand rests, polished by centuries of standing up and sitting down. 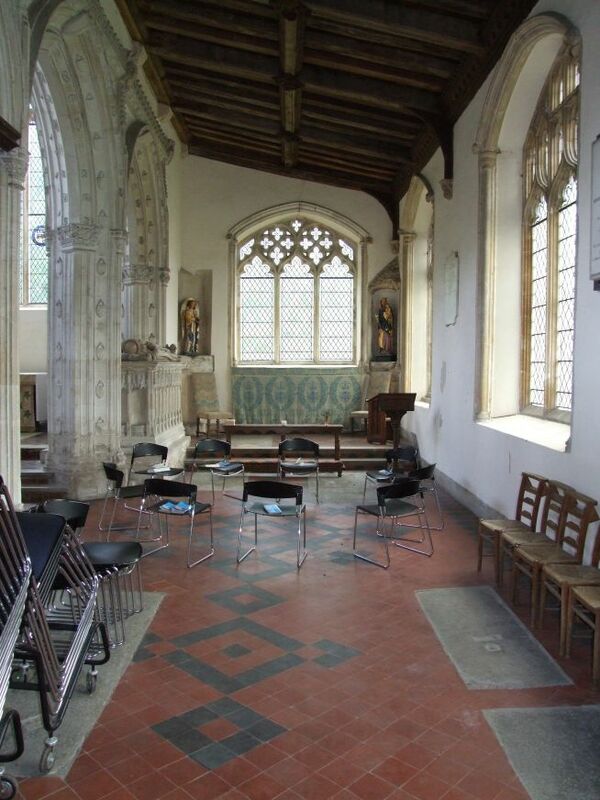 Beneath them is an acoustic chamber, as at Blythburgh, an early form of amplification designed to add resonance to the voices of those singing the offices. But within a century, it was all over. The Reformation did for the College of Priests and prayers for the dead, and the Anglican reformers comprehensively wrecked the buildings which their ancestors had built up with such devotion. What little remained was seen off by the puritans a century later. 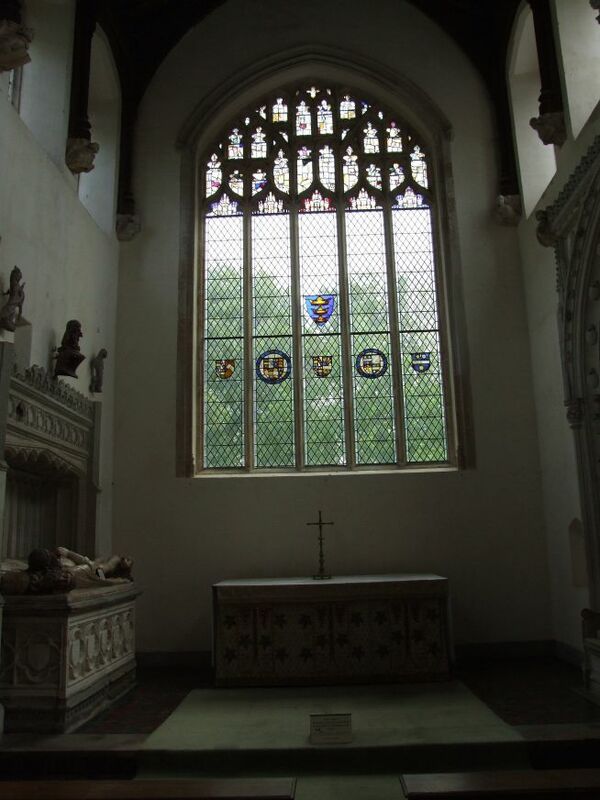 To be fair, some of the loveliest interiors in Suffolk are those which speak of the 17th and 18th century life of the buildings; but here, at Wingfield, the first response is to mourn what must have been lost. Indeed, by the 17th century this chancel was derelict and disused, probably roofless. What survives in the church from those years is ephemeral, unexceptional; except, perhaps, for the hudd, a kind of sentry box used by clergymen at burials in inclement weather. 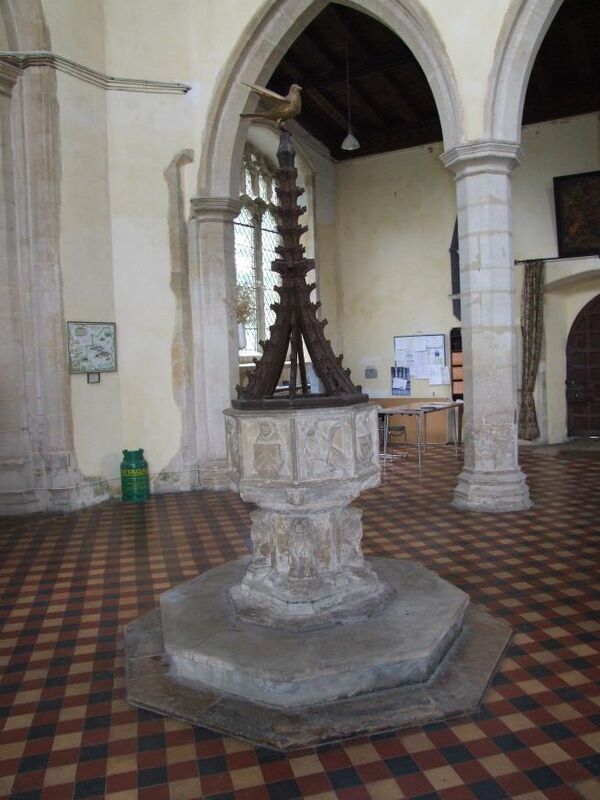 East Anglia has only one other, at Walpole St Peter in Norfolk. 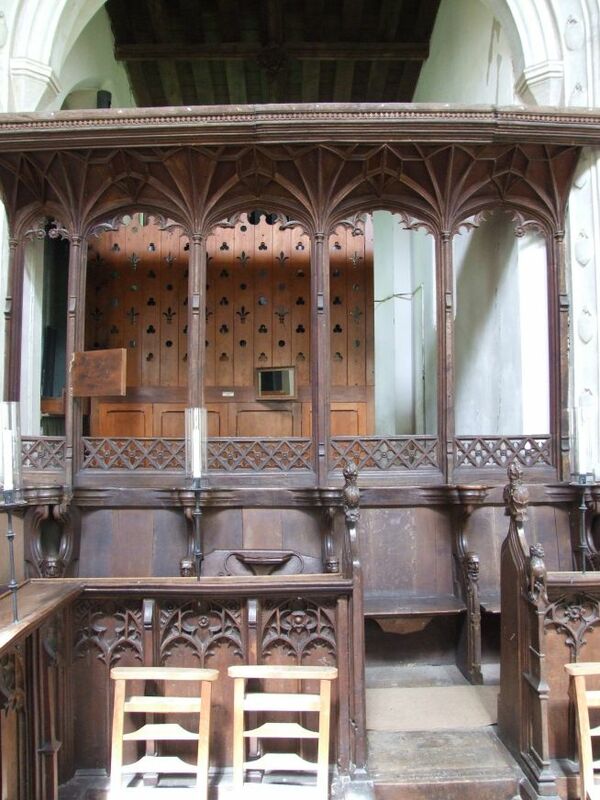 The chancel was mended in a sympathetic manner in the 1860s; fortunately, the 19th century restoration of the furnishings here came later, and the Victorians can be praised for preserving so much. 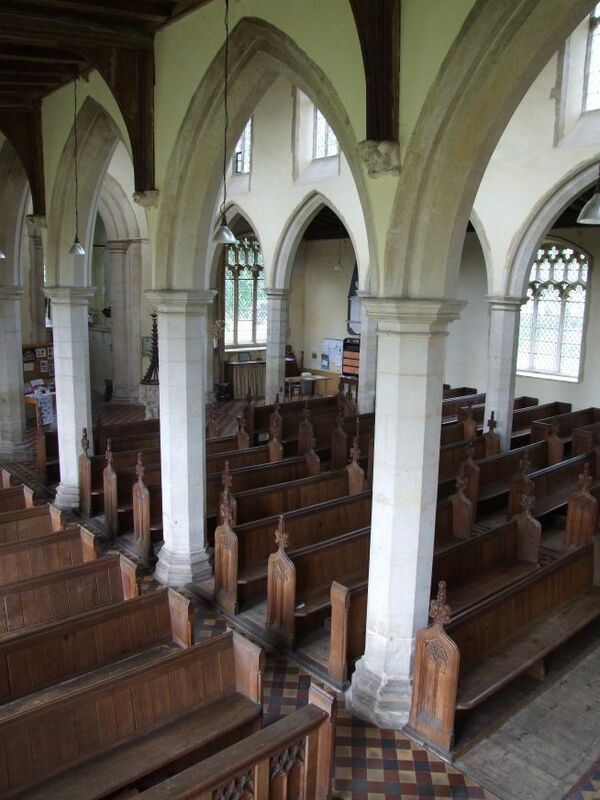 And if the nave speaks predominantly of any period, then it is of the present day, because this is obviously a thriving church. One curious note, though: in 1911, the chancel was reordered in an Anglo-catholic fashion with furnishings by the great Ninian Comper. 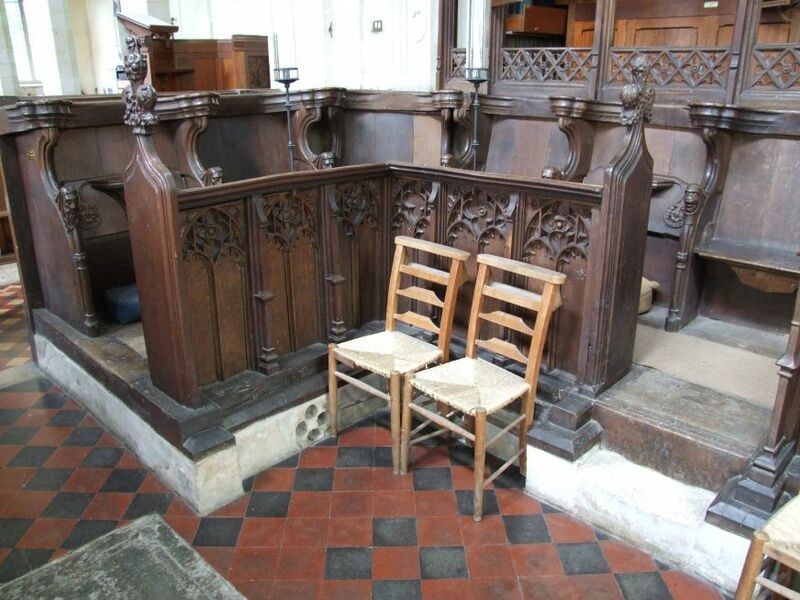 Incredibly, these were almost entirely removed and destroyed in another refurbishment in the 1960s, and all that survives of Comper are the candle holders on the return stall. 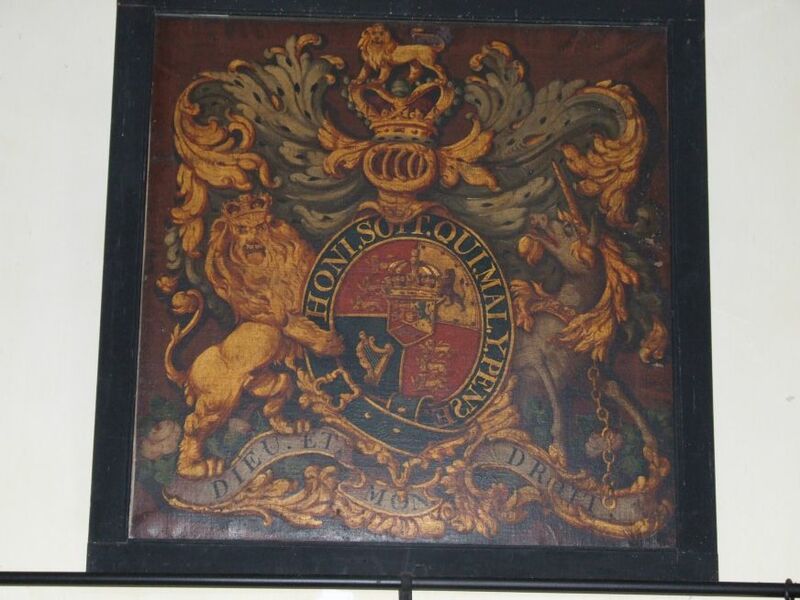 What we see today in any case is the result of another major restoration in 1999. 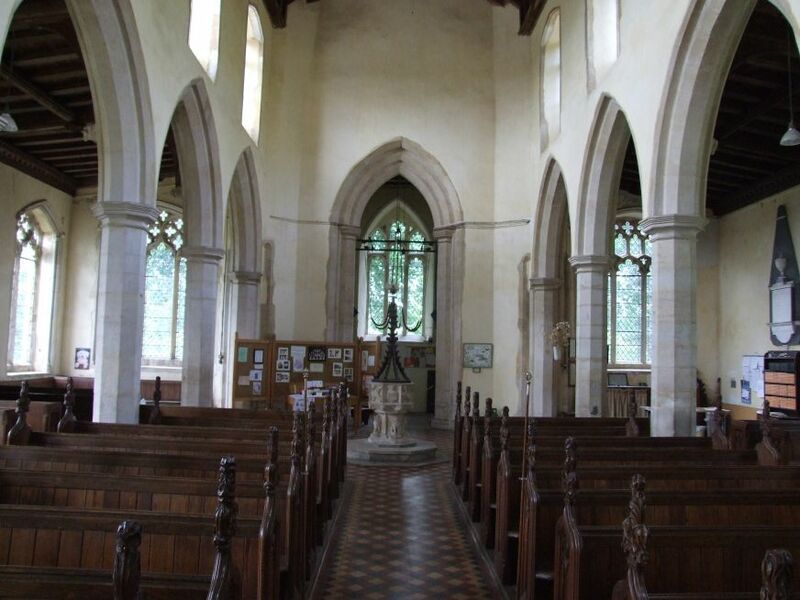 So often in a quiet, rural backwater like Wingfield we expect, and usually find, a humble church of the common people, a touchstone to the blacksmith and the wheelwright, the ploughboy and the farrier. Well, they are all here - in the graveyard, they are all around. But St Andrew is not a humble church. It is one of the great English testaments, a story of power and glory, of treachery and downfall. The Dukes of Suffolk are no more, but still St Andrew rides the hidden lanes of the county like a great ship, a ship of light. All around, the 21st century seems rather mundane and shabby by comparison.